When I bought my house, I had relatively no idea what to do with it. There are options everywhere I look. Paint color choices and furniture to be decided. How much should I upgrade the kitchen? 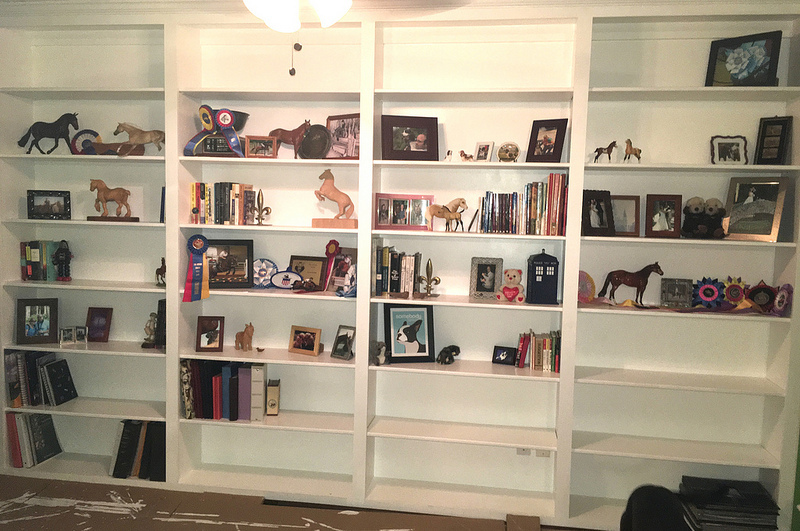 A lot of those answers are in progress, but I always knew there was one thing I wanted to do to the house – built a wall of shelves. I wanted to build a library nook in my long living room. Somewhere that I could put up all my books without squishing them into an Ikea Billy bookshelf, and eventually get a desk for writing and a chair to read in. The first step of that was having my bookshelves built. Jen hooked me up with an awesome carpenter, and when he started building the shelves I quickly realized that I’m going to need to get a lot more books. Once they were built, there was the slow process of painting them. 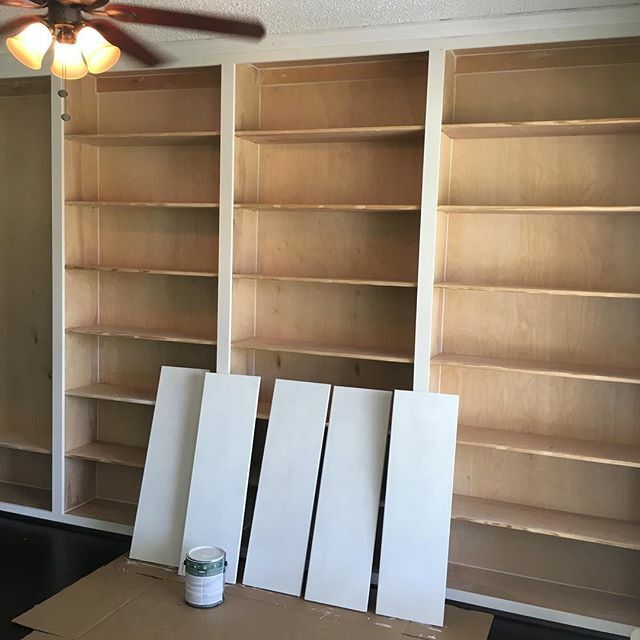 Both of my parents helped me when they came to visit, and roughly a month later all my shelves were white and ready to go. While unpacking, I had thrown a lot of books and misc items on the shelves and told myself I’d organize them at a later date. For reasons I’ve written about at length, actually settling into this home comes harder to me than I thought it would. After staring at my random belongings thrown up on my white shelves for a few weeks, I poured myself a glass of wine last night and decided to organize everything. I started with the books. Ever since college, I’ve kept a lot of books around and have maniacally organized them. Much like a real library, I organize into genre and then alphabetical order. After hauling all my books around the country, I donated the bulk of my collection to the Austin Library before we moved into our little blue house. Unpacking the books last night, I missed the ones I gave away… but I’ve already switched back from an e-reader to hard copies, so I imagine these shelves will fill up quickly. After I got my few shelves of books organized, I started filling in the other shelves. 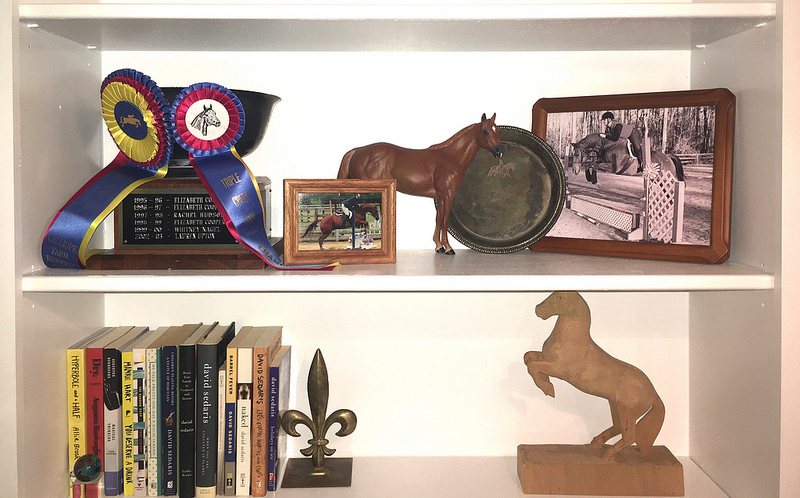 I decided to devote a shelf for each of my show horses, although Elvis got two shelves since I owned him for 7 years and we won a lot at the little open shows we did. 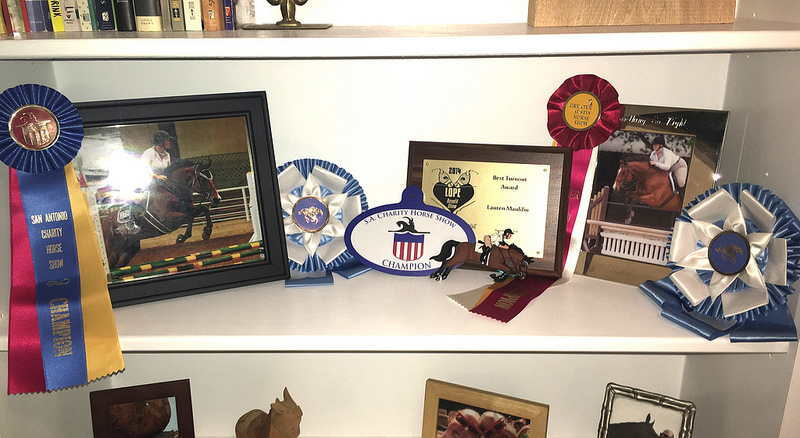 Elvis got a hunter/jumper themed shelf, and his open show shelf complete with model horse look-a-likes. Of course, nerd horse got his own shelf. It’s probably my favorite, because he gives me all the feels. I even did a little shelf as a homage to my model horse showing days. Most of those ribbons were actually made into my diy ribbon quilt, but I kept this big champion rosette because duh who doesn’t love a big champion ribbon? Speaking of model horses, I was pretty delighted to find my “Misty of Chincoteague” childhood model horse. 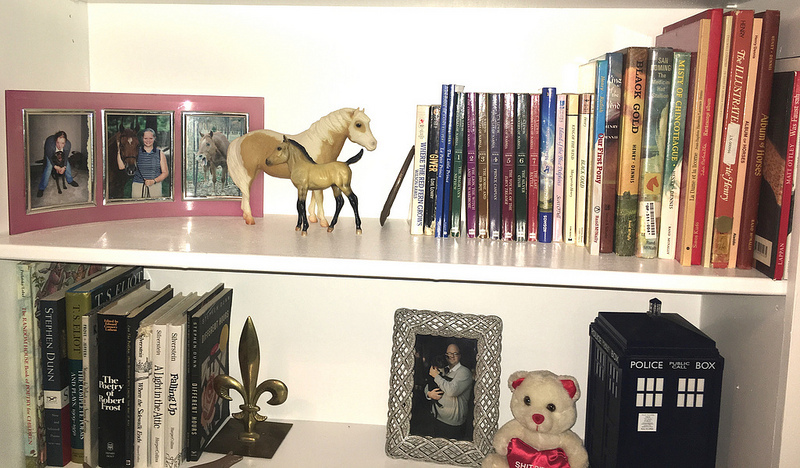 Naturally, I put her and the Sea Star foal on the shelf with all my young adult fiction and Marguerite Henry collection. Not all the shelves are horsey, although most are in some way. I grouped other items together near books that made sense. Some “happies” sent from friends are on the same shelf with my fun little picture books. They’re joined by a funny Boston Terrier print and a little painting I did of BT. When I think of BT, I think of a happy “give no shits” kind of dog that always makes me smile. All my wedding photos are grouped together with a stuffed animal Tim surprised me with from the New Orleans aquarium. It’s their star otters “Buck and Emma” sewn together hugging each other. That stuffed animal has a lot of dried dog drool on it, because Eliot has been trying to sneak it away for a dog toy for the last six years. High on the shelf, it’s safe from his thievery. I have a lot of empty spaces and room to grow here. Mixed with these beloved stories I’ve read is the story of my life. It’s told in pictures and trinkets, most of which are only significant to me. You can point to any one item on this shelf and I can tell you the story behind it. Sometimes it’s the story of a beloved animal, but just as often it’s about the man who was my best friend. Sometimes looking at these shelves bring up all the loss and pain in a way that is hard to handle, but for the most part they give me a sense of pride, peace and gratefulness. Am looking forward to getting the rest of this room finished, because I can’t think of a better place to write than a room built with the story of my life. I love love love book shelves. Can’t imagine having enough space on them to do cool decoration, but I love how it’s come out for you! My heart skipped a beat when I saw your collection of Shel Silverstein books. I still bust mine out whenever I need to read something cheerful and whimsical. 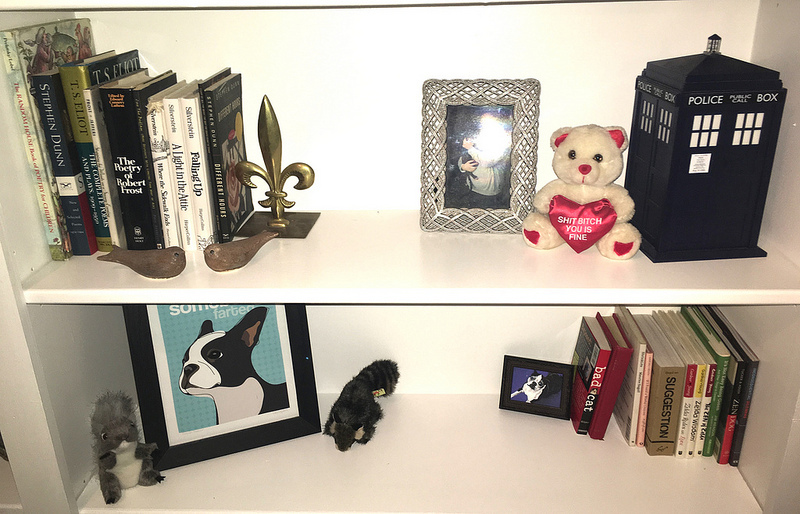 Also love the Boston terrier print from Popdoggie, I’ve got a collection of those magnets and they always make me giggle. Your library is what my dreams are made of! It’s also interesting to note that the corner of one has been chewed by a certain Springer Spaniel when he was a wee pup. What a wonderful collection you have made. And will continue to make! So many possibilities, with the past right there to guide you. I love it. Never heard of model horse showing… I’m intrigued! I love your shelves! I really love how you’ve got the space to have everything spread out and organized. My shelves are so stuffed that I’m concerned about their structural integrity if I remove too many from one place. Love this… what a beautiful space filled with beautiful, meaningful things. It’s perfect! This is so cool. My shelves are so overflowing with books, I don’t have room for much decoration. I love how much stuff you get to display. All of my Breyer are in a box in storage. LOVE! This is so lovely in so many ways! I love the memories, the books, all the humans and animals you love are there… it’s just perfect! I love this! I love that you grouped trinkets with genre’s. I love that your horse’s each have a shelf (or two). And I especially love the wedding shelf. I have a Misty and Sea Star too! And the Bad Cat book. Your built-ins are lovely and filled with memories. You should get a little hook (screw in or command) to put on the underside of the shelf above your Simon shelf, that way you can hang your Simon ornament there. I wish I could arrange a bookshelf so carefully and thoughtfully. I’m so excited that they’re coming together for you, know how happy you were to be getting them installed. I love book shelves! Your’s are lovely and what an adventure to look forward to with filling them! What a great idea with the shelves. 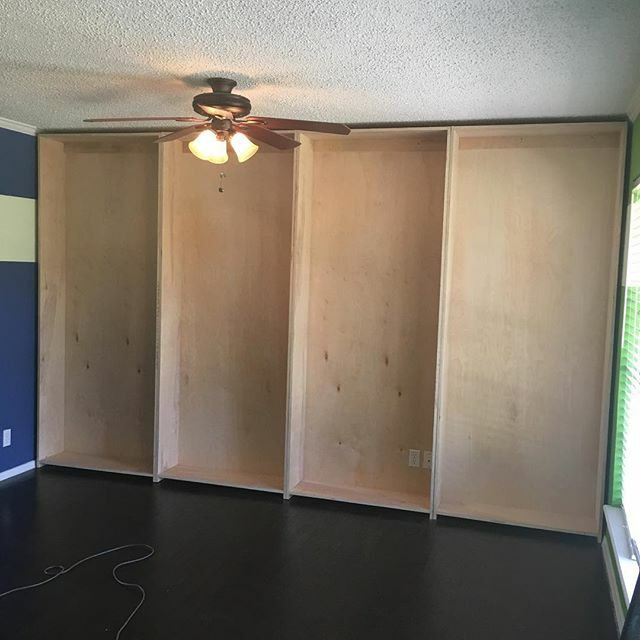 I’m now looking around my tiny house and figuring out where to put some built ins…. Love the built-in shelves…! Maybe someday I’ll get that in my house. I am currently living the “everything-crammed-onto-an-ikea-billy-shelf” life right now. Doesn’t do justice to my favourite books and memorabilia. I LOVE your bookshelves. I’ve always wanted a house with shelves like that and a cozy place to read. I’m enjoying seeing your home shape up. You have a great decorating sense. I LOVE it! What a great way to show off your books, your photos, your life. I love what you did! Um, TARDIS! <3 Congratulations, they look amazing. That's a dream project of mine too — hmmm, my "office" bedroom (aka that one where you can't see the floor) is a blank slate… You definitely have a great aesthetic! If you need books, I'm having a major pile-up problem, they need homes!